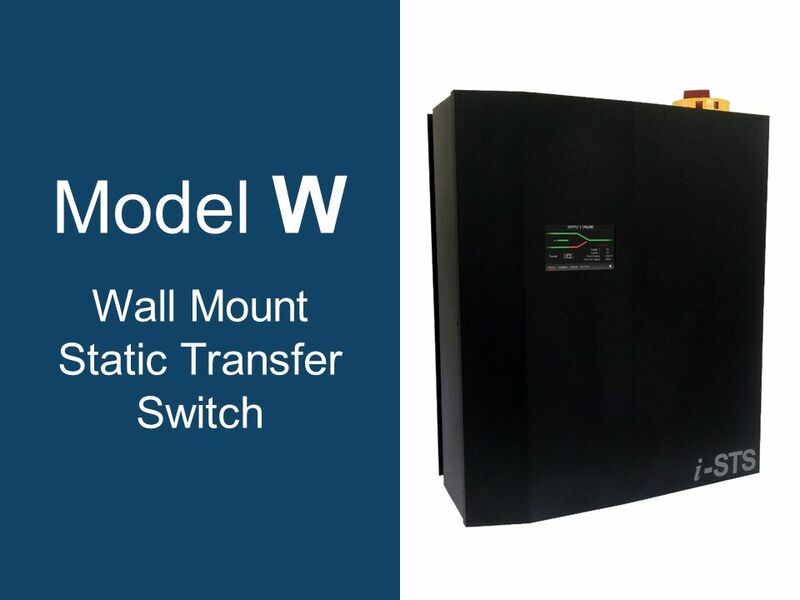 Model W Wall Mount Static Transfer Switch. Why choose a model W static transfer switch? Increases power availability. Integrated maintenance bypass. True. 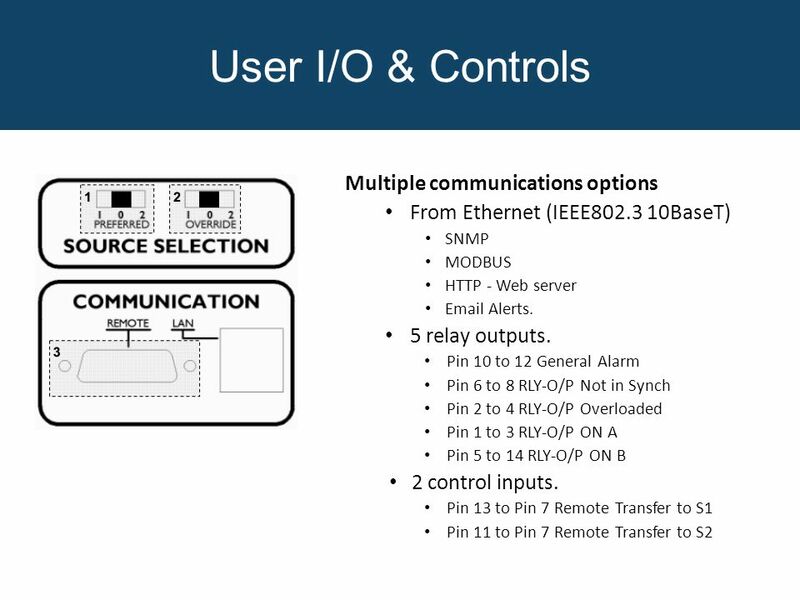 2 Why choose a model W static transfer switch? Increases power availability. Integrated maintenance bypass. True solid state. Input isolators. Rugged, reliable design. Fast, Intelligent transfers. One touch transfer. Available in both single and three phase. 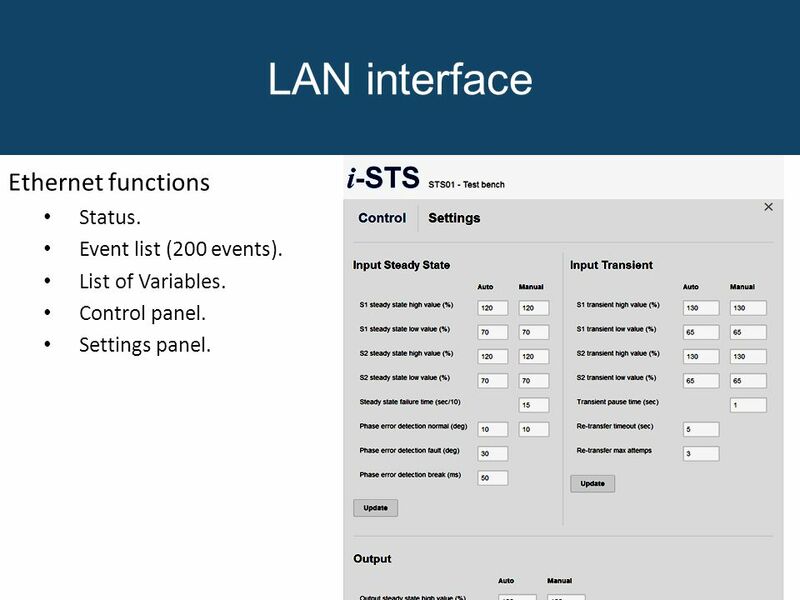 Built In LAN Web Server and HLI. Available with either LCD or decal interface. Supported current up to 100A. 3 Features Fast, reliable switching Transparent transfer – less than ¼ cycle. Solid state devices are far superior to their electro-mechanical equivalents. Triple redundant internal power sources. 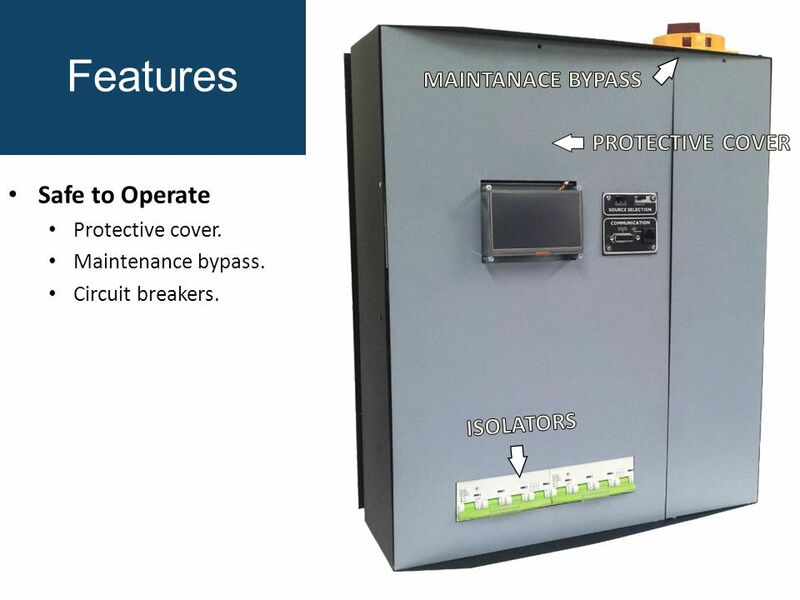 4 Features Safe to Operate Protective cover. Maintenance bypass. Circuit breakers. 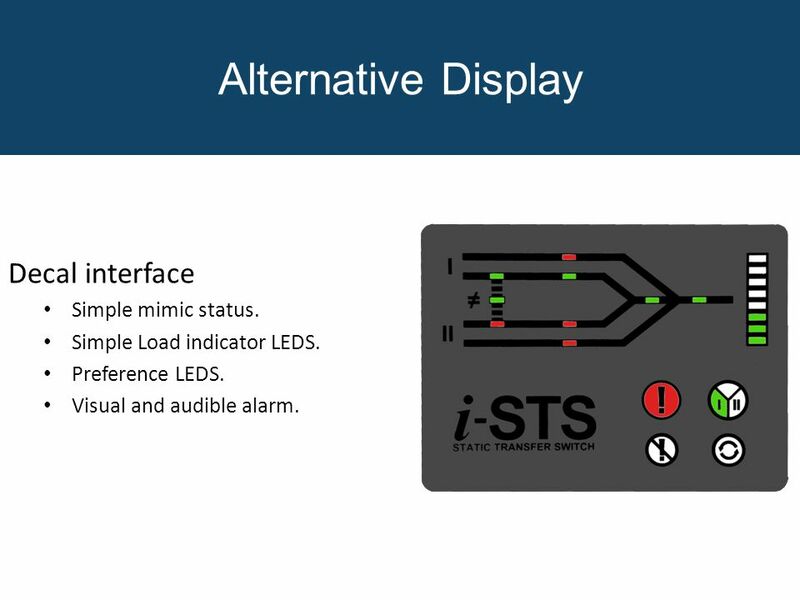 5 Features Real time monitoring Clear LCD MIMIC status. 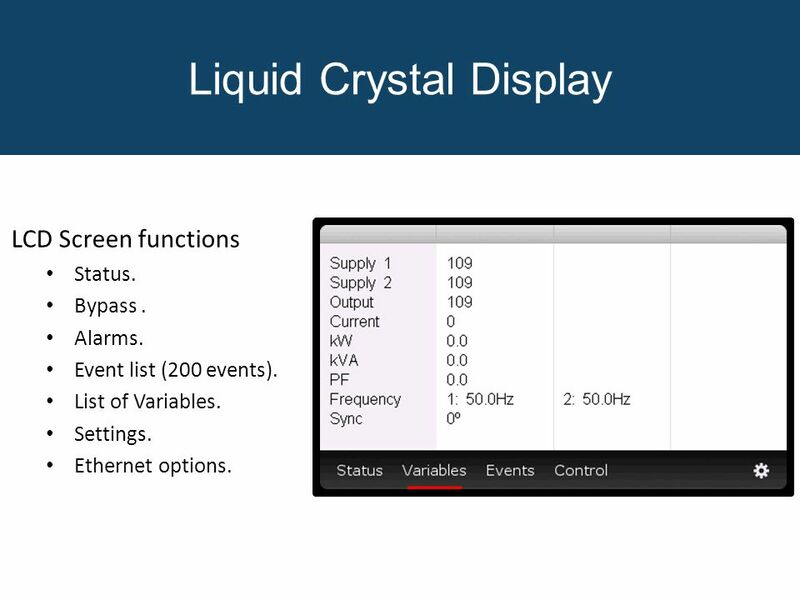 Touch screen, LCD shows input/output voltage and current. Visible and audible alarm. Ethernet web server. 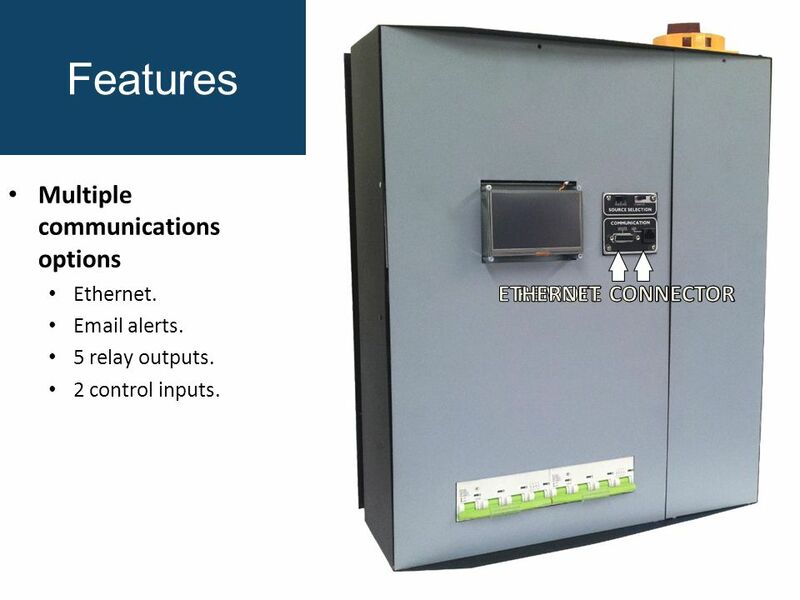 6 Features Multiple communications options Ethernet. Email alerts. 5 relay outputs. 2 control inputs. 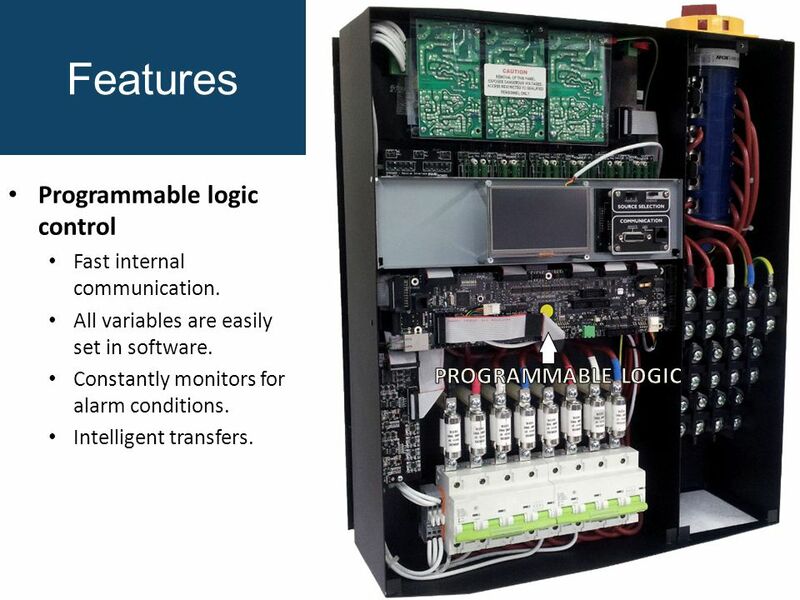 11 Features Programmable logic control Fast internal communication. All variables are easily set in software. Constantly monitors for alarm conditions. Intelligent transfers. 12 Features Flexible input/output configurations Entry through either Top or Bottom. Bolt connecters allowing for universal connections up to 50 mm 2. Plenty of space for connections. 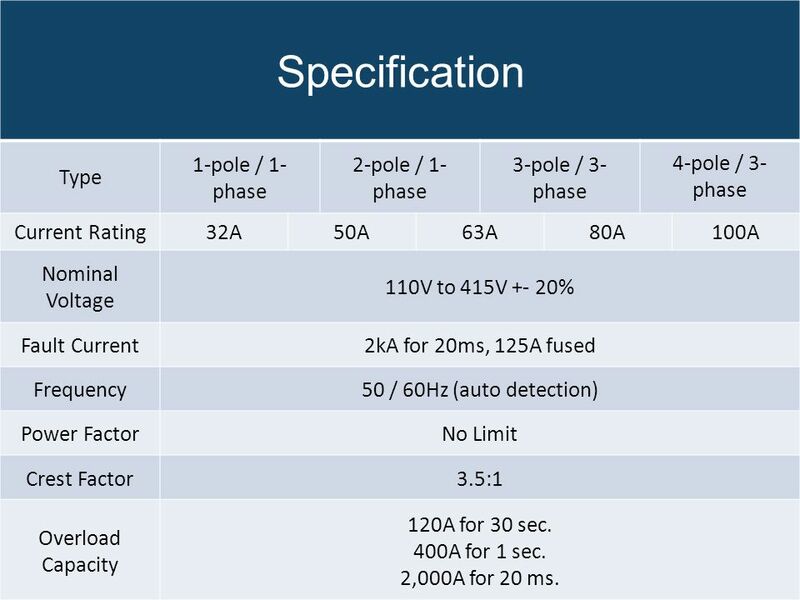 13 Specification Type 1-pole / 1- phase 2-pole / 1- phase 3-pole / 3- phase 4-pole / 3- phase Current Rating32A50A63A80A100A Nominal Voltage 110V to 415V +- 20% Fault Current2kA for 20ms, 125A fused Frequency50 / 60Hz (auto detection) Power FactorNo Limit Crest Factor3.5:1 Overload Capacity 120A for 30 sec. 400A for 1 sec. 2,000A for 20 ms.
Download ppt "Model W Wall Mount Static Transfer Switch. 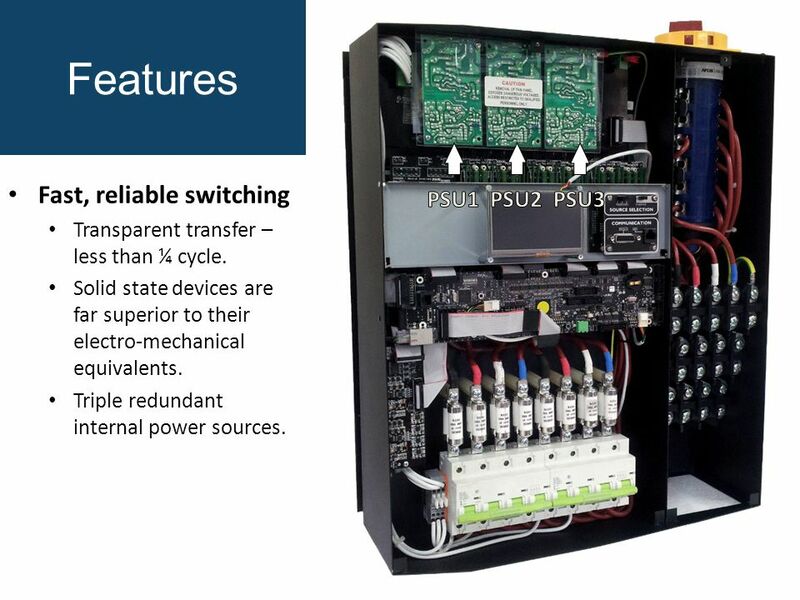 Why choose a model W static transfer switch? Increases power availability. Integrated maintenance bypass. True." Model H Free Standing Static Transfer Switch. 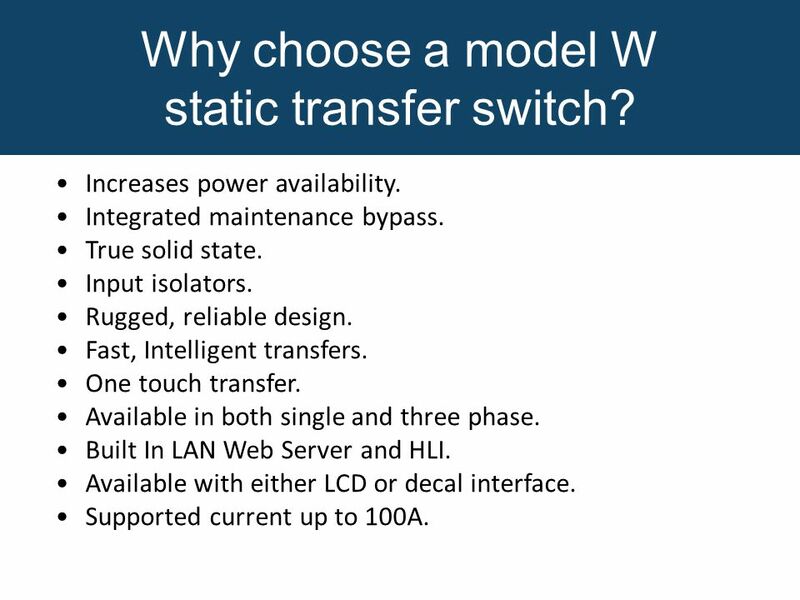 Why choose a model H static transfer switch? Increases power availability. True solid state. Rugged, reliable. POC Security System High security system combining PIN-on-Card, information security, physical access, control and alarm – all in one system. Model B1 19-inch Rack Static Transfer Switch. Why choose a model B1 static transfer switch? Increases power availability. True solid state. Rugged, reliable. PYROCON12 De-Ice controller Technician Operation Presentation 2013. 1 Bosch Solution 16i Intrusion Control System. 2 STAU/SAL | March 2010 | © Robert Bosch GmbH reserves all rights even in the event of industrial property. 1 Rev /02 Modular Construction Dual/Redundant CPU/Power Supply Support TCP/IP Communication Protocol 4096 Camera by 512 Monitor Switching English. 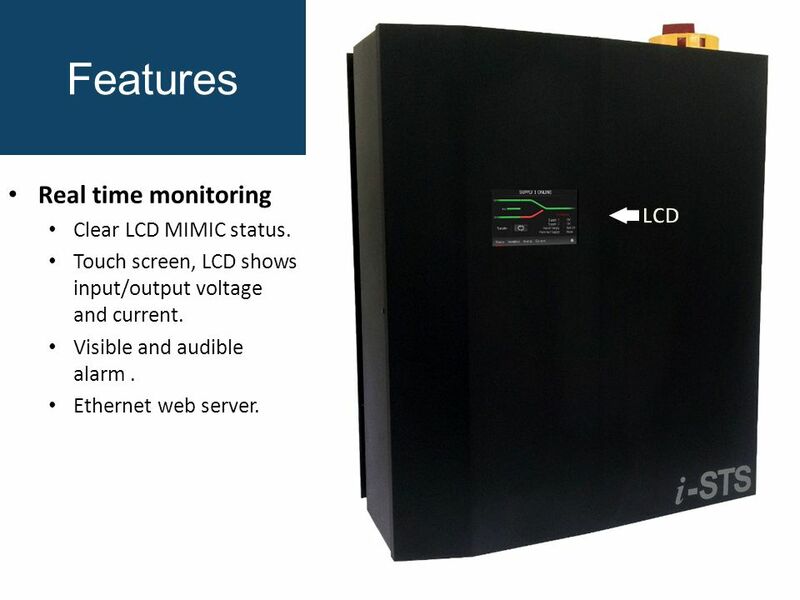 LP-31 Series Uninterruptible Power Supply Product Management GE Consumer & Industrial Power Protection.